Peel and cut the pear into small cubes. Place the pears with the minced ginger and honey in a sauce pan. Heat and stir until ingredients are combined and pear is tender, 3-4 minutes. Remove from heat and set aside. 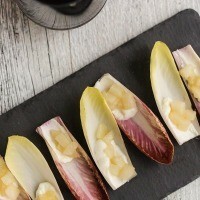 Cut roughly a 1/2″ from the bottom of the endive and carefully peel off the leaves. Smear 2-3 teaspoons of goat cheese and top with a small spoonful of pears. Repeat with remaining leaves, goat cheese, and pears. Serve warm or chilled.